It is easy to think that maintenance and performance don’t really have much in common, but in reality, you can’t have one without the other. A car can not perform at its peak unless it is properly maintained. The thing is, once you see what can be accomplished by adding this and tweaking that, well, pretty soon, you have a long list of things that you want to do to your car. It can become an obsession, really. What you have to watch out for is getting tunnel vision. Focusing on what you can put on or modify next to get that extra little bit of performance, and loosing sight of doing the little things necessary to keep your car happy can have some pretty nasty consequences. How do I know all this you might ask? Well, as you may have guessed from my previous installments, I definitely have a tendency to get obsessed. I am usually pretty good at keeping things in perspective; however, you also may have noticed that we are at something of a crossroads with the car. All the simple things have been done, and from here on out it gets a little more complicated, and I have been busy trying to decide what to focus on next. But rest assured that some big changes are on the way. Actually, a lot of them are sitting right here, waiting to go on. What am I waiting for? Funny you should ask. You see, I got a wake up call a few weeks ago when I pulled into work. It was a cool morning like most this time of the year, but when I pulled into the parking lot at work, and turned the car off, I noticed something funny. My radiator fans had been running. This caught my attention because I don’t have a long drive into work, less than 5 miles actually, and it is winter here in Colorado, and so most mornings when I am making the drive in, the outside temperatures are below freezing. Yet in my 15 minute drive in, my car has warmed up to the point that the fans have cycled on. The real clincher was that I have a Koyo Aluminum Radiator that should give me an even better cooling capacity. Add that to the equation, and it was pretty clear that I had problem. Now in reality, is this a serious issue? Well, no. Not yet any way. You have to be really mindful of cooling issues on Subaru’s though because if you overheat even once, there is a chance that you will warp your heads, blow a head-gasket, and maybe even score your cylinder walls. What is a little deceptive about the factory temp gauge is that once it reaches its “normal” level, it will stay there through about a 30 degree temperature range. So if it starts to go up, it needs to be addressed immediately. But I wasn’t there yet, and as long as I get taken care of, no harm done. More than likely, it was a sticking thermostat which is both cheap and easy to replace. So what does this have to do with maintenance? Well, while I have been figuring out what I was going to put on the car next, and amassing parts, I had totally forgot about keeping the car in top running condition. And what further complicates matters is that I bought the car used. I got the car with 64,000 miles on the clock. Did it have the 60,000 maintenance done? Yes. Well I think it did. But did they take care of everything that needed attention, or did they just do the minimal service? I have no idea. Not only that, but what about my timing belt? Subaru recommends replacing it every 62,000 miles, but they should be good to 100,000. So do I have the original, or a new one? Now, if I was simply using this car for commuting, I could certainly wait a while. The thing is that I really want to start improving the power, handling, and brakes on the car with the full intention of taking it to the tack as much as I can this summer. The last thing I want is to be worried that my timing belt is going to skip if I push too hard, or about the car overheating, or anything else for that matter. My point is that if you are going to improve your car’s performance above and beyond the way it came from the factory, then you need to not only keep up with scheduled maintenance, but go above and beyond there as well. This means staying up on all fluid changes, and using top quality fluids, and maybe replacing parts that might wear out before they get the chance to ensure that your car will perform at its best. This is essential, even if it means you have to wait a little longer to get your car to go, stop and turn the way that you want it to. It was with this realization that I decided to leave the parts where they sat, and make sure that my car was in top mechanical shape before I started throwing parts at it. All right, we all ready know that the car needs a thermostat, and togo one further, I decided to replace the water pump as well. Since the timing belt has to be removed to get at the water pump, I decided I might as well put on a new belt and tensioner as well. Fortunately, once we got everything apart, I was relieved to find that everything looked to be in good shape. When we started to put things back together, I was just going to use a factory timing belt, but after doing a little research, I decided to go with the STI Timing Belt instead. There are two reasons. 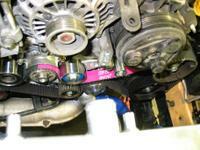 First, the STI timing belt uses Kevlar fibers for reinforcement rather than Cotton fibers like to OEM belt. I was told that makes it 2 – 3 times stronger than the OEM belt. Second, it turns out that there may be some other improvements made to the STI Timing Belt, but because it is very similar the timing belt used on the Subaru WRC car, so they couldn’t tell me. I decided that if it was good enough for the World Rally, it would be more than good enough for me. But I didn’t stop there. I decided to do a little more preventative maintenance. 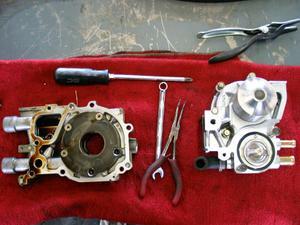 First off, since we were here, I decided to re-seal my oil pump. This isn’t too hard since we are here all ready, but if it should start to leak, then we would have to do all this over again. Also, since you use Fuji-bond to re-seal the pump, it is something that you should only have to do once. 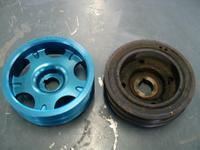 Lastly, there is a small idler pulley for the timing belt that has a tendency to fail more than the rest. I decided to replace that as well. If you look at the picture, you can see that the original has a single bearing in the middle, making it a bit unstable, where as the up-dated part has two bearings, one at the top and one on the bottom to make it a lot more stable. 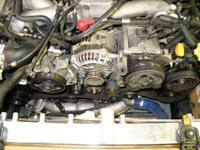 Once all that was done and we were putting everything back together, I decided to put on a Cobb Lightened Crank Pulley. I must admit that I have been a little skeptical of the improvements this could give, but I have been pleasantly surprised. I wouldn’t say that I feel that the car is making any more power, but the engine rev’s and accelerates a lot more smoothly. Finally, I decided to throw in a new set of NGK spark plugs. I actually stuck with the stock heat range. Spark plug heat ranges are a little counter intuitive. When you put in a “colder” plug, that means that the plug is better at transferring heat out of the combustion chamber. This is important if you are generating a lot more heat because you are making a lot more power. What you have to consider is how often are you getting to that point? The potential down side to a colder plug is that if you don’t get the plug hot enough, it can develop deposits and foul quickly. Since I drive around town for the most part, I am just going to play it safe and stick with the stock heat range. Now did I go a little overboard with all these parts? Maybe. But considering what I am trying to accomplish with the car, I really just did some basic maintenance. I have no doubt that my car should be trouble free for thousands of miles and a few track days to boot As long as I don’t create a problem with all these parts that I am throwing on… But that will be for the next installment. Maintaining a car could be expensive at times but it also prevents the owner from spending too much when trouble comes in. 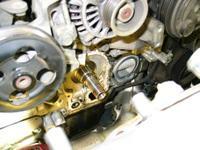 It is wise to check the car engine regularly to monitor for its performance and if it needs immediate repair. Doing a preventive maintenance is really important to make sure that you have a good engine,and it is also for our safety in case there are parts that are malfunction. True. Maintenance is required to achieve peak performance. All cars are machines, and it's up to the driver to make sure that the machine is in top condition. I appreciate you posted this one and this is really useful. It can also be a guide and reminder to most car owners on how they should took care of their cars. Maintenance is really a must for your car since it increases the longevity of your car and maintain efficiency on performance. It is a continuous process and sometimes can cost you a lot. But it's better than spending a whole lot from big damages. I had to do so much maintenance on my car before I got a new one at Suzuki in McAllen, TX. It got to be too much for me, which is why I ended up getting a new one! This is really great information though, this will certainly be helpful to readers! It's important to know all these stuff. Great stuff right here. I have the present concerning our mom for the Holiday due she is actually letter precious jewelry freak. Your one thing she cannot wear a great deal concerning was, bracelets. I purchased this girl that appeal bracelet and/or when she launched it yesterday she absolutley liked information technology! Now the problem is actually, her obtaining that it regarding and/or off of by by herself. Haha... total ideal product or service, information technology sent to came incredibly early as well as my personal mother is actually experiencing things. Thank your. Our boy provided me the concerning moms evening. He realizes im not really around price but everything originates from your heart. I cannot know this has the favourite color as well as really fits the wrist. I never could choose bracelets to suit headphonesthe smaller wrist. Quite pleased to has recieved this one as a gifts.